Big changes are coming for Columbus Crew SC. On the heels of major announcements, like coach Gregg Berhalter’s exit for the U.S. Men’s National Team, the soon-to-be owners of the Columbus Crew and the City of Columbus have announced a new vision for Mapfre Stadium. The current home of the Crew will be repurposed into Columbus Community Sports Park, a shared-use center with an indoor soccer field and basketball courts, tournament-level outdoor athletic fields and programming spaces for multigenerational activities. At a press conference on Wednesday morning, it was announced that the Crew would continue to play at Mapfre for two years while construction takes place on a new stadium for the team. After that, the transformation of Mapfre will begin. “We are excited about the possibilities of new ownership of the Columbus Crew and all that will bring to the City. Part of that plan must include reimagining the existing stadium, so we are investing in a community sports complex that will serve the people of Columbus,” said Ginther. Announcements regarding the new stadium will be made on Thursday at Land-Grant Brewing Co. in Franklinton at 12 p.m.
Stadium rendering proposed by #SaveTheCrew over the summer. In August, the #SaveTheCrew movement put out a stunning proposal for a downtown stadium. The renderings were absolutely gorgeous and the facility itself featured an Arena District location, 22,587 seat capacity, an underground parking garage, a solar roof, and even onsite training facilities. 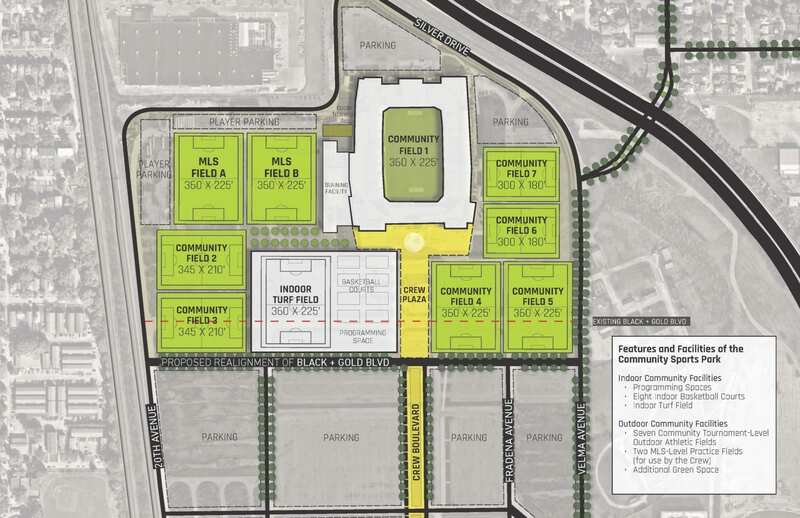 Now that the new sports complex has been announced at Mapfre, the new site won’t need those training facilities. But here’s hoping the solar roof makes the cut.